Cigarette tube injection machines have revolutionized the RYO Market. Using these wonderful devices and readily available pre-manufactured filtered cigarette tubes, one can create (roll is not a precisely accurate description) filtered cigarettes that are indistinguishable from pre-manufactured brand names (except, of course, they don't have the brand name on them, they taste a whole lot better, and are far fresher). While there are a number of manufacturers of injection machines, this is the most unusual and potentially market-changing advance we have yet seen in the RYO world. Known as La Cigaretterie, it is a remarkable new concept that dispenses finished cigarettes after you choose the kinds of tobacco and tubes you want. 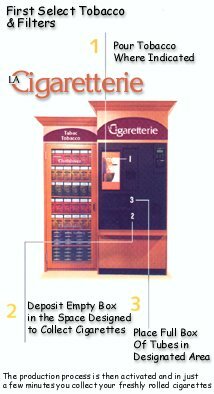 Purely from a convenience standpoint, the idea of vending machines that dispense tubes and tobacco seems like a great one. 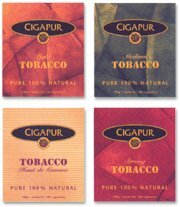 To take the process one step further and actually stuff the tubes with your chosen tobacco is potentially brilliant - if they can pull it off. We have yet to be able to contact these folks and have no information as to whether these machines actually exist or not. The idea of mass producing injected cigarettes is not new and it certainly interests many of our readers. However, the logistical engineering required for mass injection is far more difficult than for mass rolling mainly due to the flimsy nature of tubes and the inconsistent texture of good rolling tobacco. Nonetheless we thought our readers would find this product fascinating. And we wish the Montreal-based firm that manufacturers (will manufacture) this vending machine the greatest of success in their endeavor. Basically the scenario is this: You enter the retail store that provides the vending machine and pay for your turn at the machine. You are given a token to place in the machine. This is an obvious necessity both in the US and Canada where very strict laws are enforced for the sale of tobacco products to minors. After inserting your token, you select the kind of tubes you want and then the tobacco. 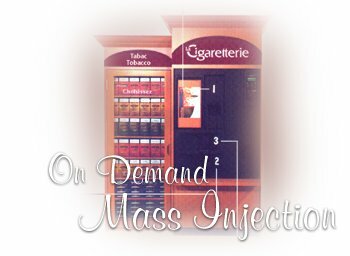 According to the information on their website, (www.cigaretterie.com) after a few minutes, 100 perfectly injected cigarettes are dispensed into your waiting box. (See graphic at right for a pictorial view of the process). We have no information on how the machine processes the raw components to successfully complete its task but if it works it could start an entirely new industry in mass injection cigarette processors. Most of us have been frustrated over the years with so called "vaporware" whereby software companies advertise, promote and sometimes even sell a new product before it actually exists, at least in finished form. The professional electronic musical equipment industry has also been guilty of this practice known as "pre-selling". As a matter of fact, I am still waiting for one company's new powered sub-woofer device that was shown at last years NAMM show where orders were taken and the product has yet to come into existence. Who knows, if LaCigaretterie actually exists in demo form or perhaps they have hired dwarves to sit inside and madly stuff tubes with a Supermatic. We certainly hope this is not the case and welcome any information any of you may have out there on this device (or my sub-woofer for that matter). 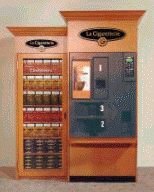 At this time LaCigaretterie necessitates the use of their tobacco and tubes (Cigapur by name) but if you visit their website (we repeat it for your once again - www.cigaretterie.com), you will find hints that soon this wondrous machine will support other brands as well. However, even if nothing at all comes of this machine in its currently promoted form, it does illustrate the necessity of widening the availability of RYO products including kiosk-like vending machines for tubes, papers, and tobacco. We look forward to hearing from retailers, distributors, and the general public on this one. And of course, from the manufacturers of LaCigaretterie themselves. Check back in early December for our Holiday Gift Buyer's Guide where you will find all of the injectors we have reviewed this past year as well as several we have missed AND some of the best places to shop for them. -the ed.